I expect that worship leaders will direct my attention to God, not to themselves. 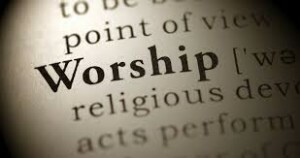 I expect that worship will not be a performance by the singers and musicians no matter how talented they are. I expect that the congregation is not an audience and that the sanctuary or “worship center” is not a concert hall. At least, not on Sunday mornings. I expect that most of the songs and hymns will be songs that I am familiar with, or at least songs that have singable keys and somewhat predictable melody lines. I expect that when we DO sing a song I’m familiar with (like “When I Survey the Wondrous Cross”) it will still have the same words and melody I remember. I expect that when the worship leader introduces a new song, he or she will take some time to help the congregation learn it rather than just showing off how well he or she knows it. I expect that the songs we sing will be about God, not so much about me. I expect the songs we sing to have good (or at least acceptable) theology. I expect the songs we sing to have inspiring lyrics. Songs that include words like “wanna” and “woahhhhh” don’t inspire too much. I expect that the song lyrics will be available to me and others in the congregation in some form or another at the appropriate time, not five seconds after the lyrics have been sung. I expect that the worship leader understands that not everyone can remain standing for more than 15 or 20 minutes if they are over the age of 30. I’ll stop there. Those are just some of the annoying expectations I have of worship which sometimes become stumbling blocks for me. It’s hard to give them up, but maybe that’s what I need to do. Let me just say that most Sundays I am able to worship without my expectations ruining things for me. I’m grateful for the talented worship leaders who serve in our church week after week and do the best they can to provide a worship experience that includes and involves everyone. I do look forward to attending worship each week and most of the time it’s easy to focus on God and worship with the rest of our congregation. But now and then, those annoying expectations rear their ugly heads. What are your thoughts? What are some of your expectations in worship? This entry was posted in Ministry, Theology and tagged the church, worship. Bookmark the permalink. Hello! I have just discovered you, and am glad I did. Pastor and bluegrasser too? Very cool!! My husband and I are on our church’s “worship team”, and I still have very mixed feelings. I too feel that it isn’t a concert featuring us. But what does that look like? It is different for everyone. Some think that having singers and band up front at all, or anything besides a piano or organ and choir, is not appropriate. I have an issue with churches I’ve attended that have big screens mounted from the ceiling showing nothing but close-ups of the band and singers – nothing pointing the way to Christ. And then I have also been able to sing from the congregation, watching the reactions of others. Maybe an old comfortable hymn starts, and the older and / or conservative members light up, but the younger ones look disengaged. Then the next song is contemporary and the scenario reverses. As to the words appearing just a little (or a lot) too late, that bothers me too. For several years I did the job of putting the words to the songs, and was very particular about that. But I know that our computer system is also a bit old and overloaded, and sometimes just freezes (it’s possessed, I think). So I think the Lord is dealing with my critical spirit in a number of ways. When I wake up Sunday morning, I grab Jesus’s hand before I get out of bed, then I start counting my blessings. My husband and I are not uber-talented, but our efforts are welcomed and encouraged. I see the leaders trying their best to serve a church blessed to have great representation from multiple generations and from many church backgrounds. They stay with songs that are scripturally based, and we are reminded that even Amazing Grace was “contemporary” at one time. Originally, it didn’t even have its own tune, so if it gets changed around a bit now, who am I to complain? And I get to come together with this amazing family that God almighty has gifted me with, for eternity!! And I stand up front praying for that family, that even if all songs don’t touch all people, each song will touch some until all are in a frame of mind to hear from the Lord that day. To get to be a part of that, even a little, is a blessing I hope I never take for granted.